ABC Orthodontics truly respects all active duty military, retired, veterans, and dependents for their dedicated service and commitment! Dr. Milliner is a Navy veteran and her husband is still on active duty, so we understand the military life and the challenges that come with it. We treat military members from every branch of the service and can develop a treatment plan that’s adaptable for you and your family’s needs, even if you are transitioning to or from a new location. 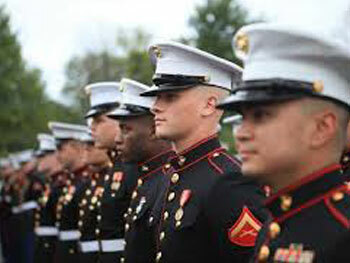 We enjoy serving our military and strive to make orthodontics a seamless process for you! Dr. Milliner and our staff work closely with the dental officers and corpsman at MCAS on a weekly basis. In fact, Dr. Milliner actually served with several of the dental officers in Yuma while she was on active duty! We understand military and operational commitments, so we work closely with our active-duty patients and their military dentists to ensure we have a plan that meets their requirements. Most patients on active duty will be screened by the dental clinic on base and advised of one of two options. First, if you have surgical needs, you may qualify for a program in which the military will fully fund your treatment at our office. Second, if you have more routine orthodontic needs, the military will refer you to our office for a complimentary consultation to discuss treatment options and payment plans that will be covered by you. If you have any questions about this process or your unique circumstances, please call our office and one of our team members will be happy to discuss it with you. We always look forward to serving our active duty! With PCS moves, it can often be overwhelming to put “finding an orthodontist” on the list of things to do! We certainly understand this and are here to help. Whether you are arriving in Yuma with braces, want to get started with them, or need to transfer to a new orthodontist at your next duty station, our staff is well versed in this process and will make it simple and straightforward for you. We receive patients from all over the world and have even orchestrated transfers all the way to Okinawa, Japan through colleagues of Dr. Milliner! This is a regular occurrence for us, so leave the headache of insurance, records, and transfers up to Dr. Milliner and our highly trained staff. All you need to do is give our office a call and we will take care of the details for you! Thank you for your service and we look foward to serving you!